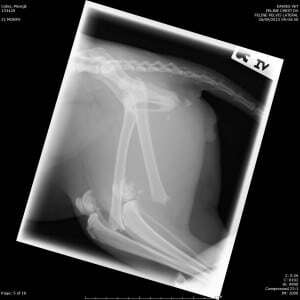 Active Pet welcomes our feline friends who are often overlooked for veterinary rehabilitation. 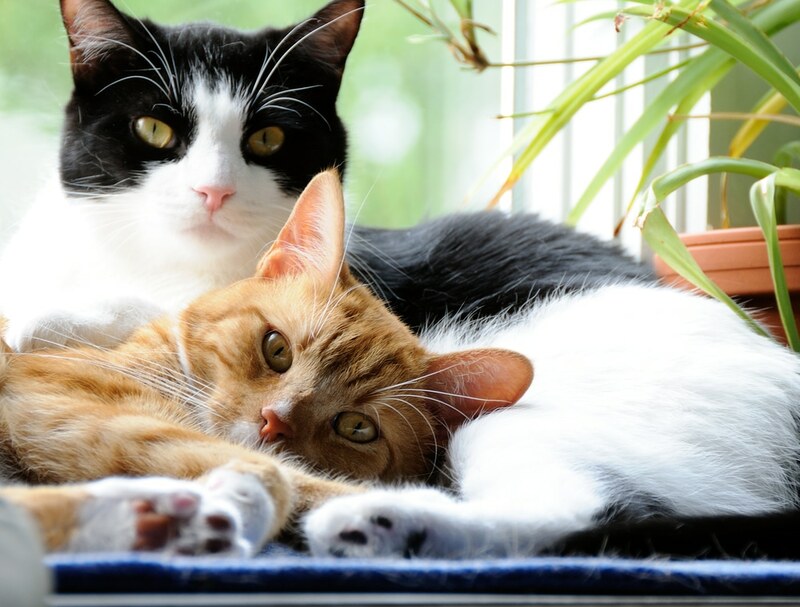 We can help your cat after injury such as a road traffic accident, after neurological injury or if your cat has osteoarthritis. Cats respond really well to rehabilitation, though sometimes we have to think ‘outside the box’ as asking them to do exactly what we want can be a little challenging! We are always amazed at how well cats respond and how quickly they pick new things up. 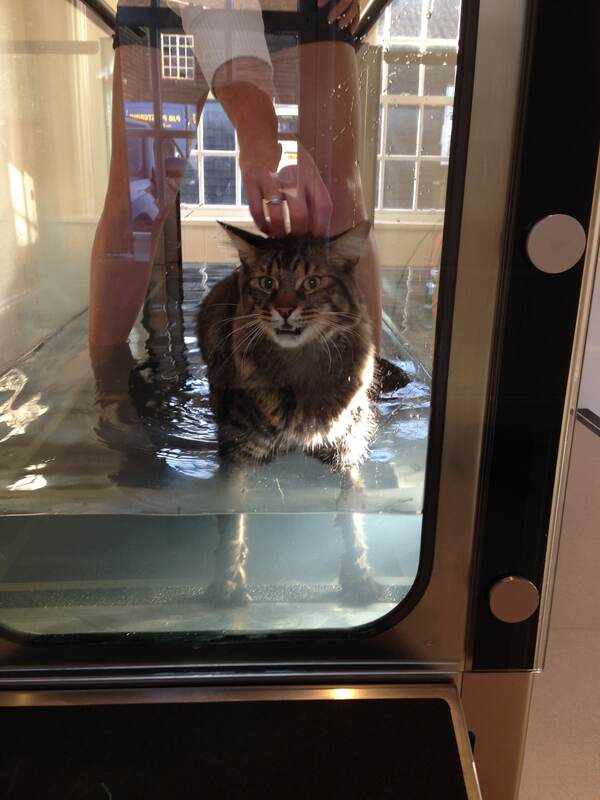 Overweight cats are also welcome at the clinic and we can help with an individual plan to help them lose weight. When your cat needs to come and see us, whether it be due to arthritis or after an accident or injury we will help you understand their unique needs and work out a personalised plan to get them back on their feet. Where possible we try and schedule your appointment when the clinic is quietest and there are no dogs around to ensure they are as relaxed as possible. We are only a short drive away from Amersham, Beaconsfield and High Wycombe but please let us know if you are coming from further afield and you are worried your cat may be stressed by their journey as we can advise you on how to make your trip as smooth as possible. Here is one of our current patients, Mowgli the Bengal x DLH cat who was hit by a car at the end of September 2013 and dislocated his jaw and his right hip and broke both his hindlimbs. He went off to stay at Davies Vet Specialists for several days while the orthopaedic surgeons put him back together again and had twice daily physiotherapy while he was there. He was hardly able to walk when he got home as he was very sore and had lost a lot of muscle. 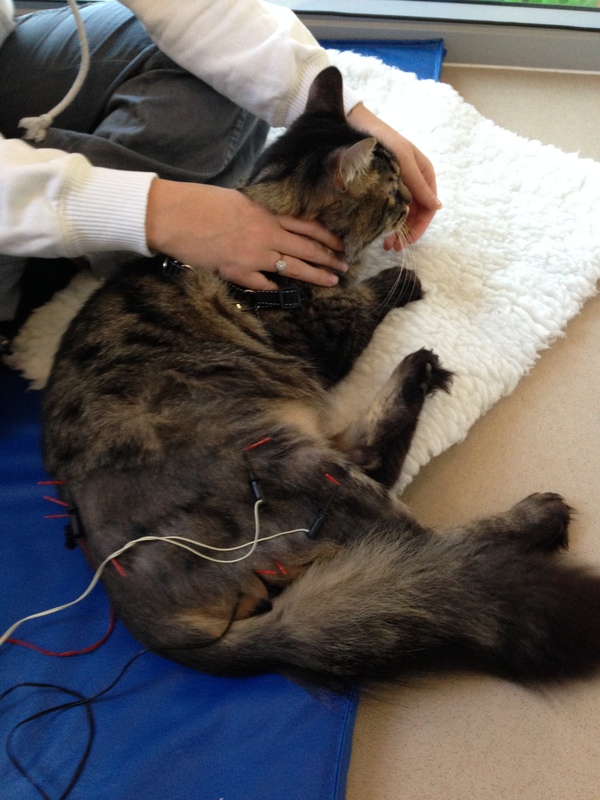 He started coming to Active Pet in October and has been receiving electroacupuncture for pain relief in addition to his medication at home and physiotherapy to help keep his muscles and joints active. After a few weeks we started him in the underwater treadmill without the water in just to get him used to the sensation of walking on the treadmill…it must be a little confusing for a cat to be walking but not going anywhere! After a couple of sessions we then added in some water to help him to walk correctly as he kept swinging his right leg out to the side and also to add a little resistance so that he can start building up his muscles in a safe and controlled fashion. Mowgli has also been doing some exercises at home so that he can continue his progress when he is not at the clinic. Once he has found the exercises easy we have been giving him more challenging ones to do and we are really pleased with how he is getting on. Luckily he has some dedicated owners at home to make sure that he is doing them!